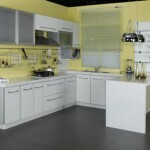 If you are going to design your own kitchen layout, you will need a couple of things. A strong constitution and the ability to practice the Zen of kitchen remodeling really is needed when you are you are renovating or installing a kitchen. 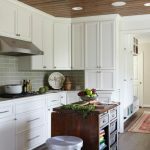 The best place to start is the kitchen layout, you really need a creative plan way beyond getting your emotional house in order to establish a solid foundation for your project, and something that will work out all right. Things you will need: Computer, house blueprint and a Drawing program or CAD software. 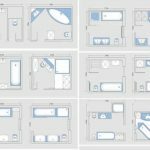 The house blueprint that came with the paperwork you received when you closed on your property, so you can see what space you have to work with, or alternatively, all aspects of the room should be measured accurately to compute the square footage of your kitchen. Electrical hubs and junctures, plumbing and weight- and nonweight-bearing walls should also be identified, also closely examine the flooring if it requires replacement. Your kitchen’s “shape” must be matched to any of the six layouts most often found in standard kitchens, such as L-shaped, U-shaped, single wall, corridor or galley, double L-shaped or even G-shaped configuration. 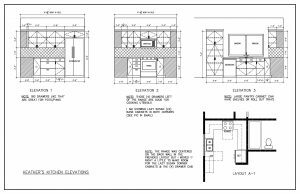 In order to design your own kitchen layout, it is highly recommended for you to make a list of requirements for your kitchen that will most affect your day-to-day kitchen operations and functions. 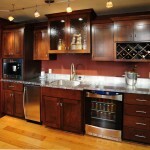 As the placement of cabinets and work surfaces are affected by this, simply ask yourself whether you require enough space for two or more people to work in the kitchen, how important the stove-to-sink distance will be to your ability to get tasks done and if you desire eating counters in the kitchen also. 4.Boot your computer. Your Draw or CAD program should be used to render a flat or 3D model of your prospective kitchen’s floor space based on the closest general shape you have identified in step #2. Keep the design in perspective as you work by simply setting a scale ratio. For instance, one square inch for every square foot. Electrical outlets, plumbing access and gas lines should be used to direct your fixture and appliance plans. The dishwasher adjacent to the sink, the sink area that closest to the main water feed, should be blocked out before earmark space for your stove at the kitchen’s gas source or electrical port. And also, space for the refrigerator that connects to a separate power source should be allocated. To indicate the extent to which base cabinets will be installed, you are required to use round, rectangular and square design icons. On the CAD program’s virtual walls, the overhead cabinet icons must be replicated. Gain the maximum amount of working space within the footprint of your kitchen layout by simply trying a variety of configurations. 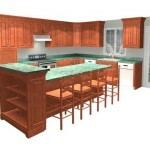 Your layout could be used to choose appropriate colors, flooring, appliances, countertops, lighting and accessories. If your kitchen is small, keep your design palette light. 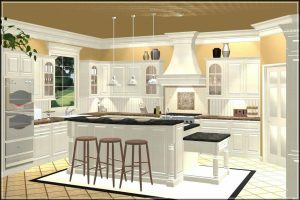 To make your kitchen design appear larger that it really is, optical illusions should be considered to be employed; a small CAD design could be dramatically transformed into an expansive-looking kitchen that belies the square footage your kitchen occupies by trompe l’oeil touches, environmental wallpaper, art and mirror.